What Kind of Carbohydrates Before Exercise? Why Are Sports Good for Your Health? Can Exercise Cause Inflammation in the Body? Ranging from disease prevention to mood enhancement, the list of benefits associated with exercise is long and impressive. Simply put, exercising regularly can lengthen and improve your life, according to the Centers for Disease Control and Prevention. There's a flip side, of course, but what you might call the "cons" of exercise are primarily unpleasant side effects that are often avoidable. On the plus side, exercise decreases your risk of death from certain diseases and improves the quality of your life by keeping difficult medical conditions at bay. The Harvard School of Public Health states that engaging in regular physical activity can help you prevent a vast range of health problems, including cardiovascular disease, stroke, type 2 diabetes, certain cancers, osteoporosis and arthritis. If you've already been diagnosed with a challenging medical condition, exercise might alleviate or eliminate some of your symptoms, including pain. Working out can also improve gastrointestinal function and improve the quality of your sleep. Exercise boosts functionality, or makes day-to-day activities easier. A well-rounded exercise program -- including aerobic, resistance, flexibility and balance training -- boosts cardiovascular endurance, increases muscular strength and improves joint range of motion. That's a powerful combination that translates into a host of functional benefits, from less fatigue when you climb the stairs to the ability to crouch comfortably in your flowerbeds. 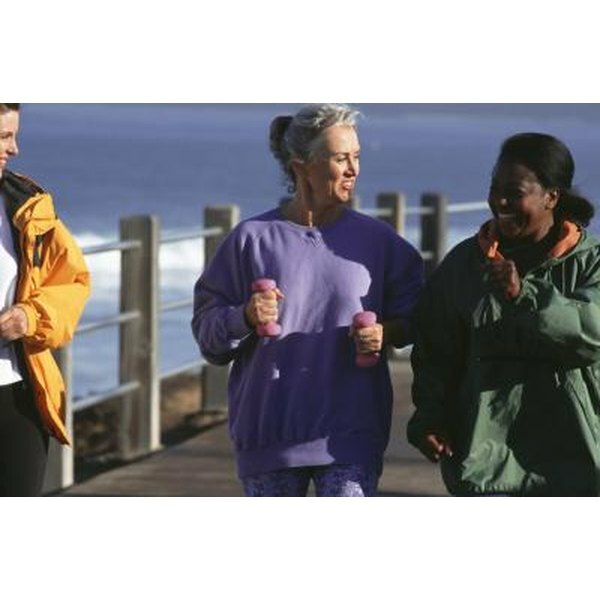 Exercise also prevents harmful bone loss and helps you maintain a smooth and graceful gait. As a result, claims the CDC, you'll be less susceptible to fall-related injury -- and possible disability -- as you age. Physical activity can help you avoid or manage a range of mood disorders -- including depression and anxiety -- and boost self-esteem. As experts at MayoClinic.org point out, exercise stimulates certain brain chemicals -- including hormones known as endorphins -- that can leave you feeling happier and more at ease. Exercise may also help if you struggle with a poor self image. Designing and sticking with a workout routine can be a real confidence booster. And you might feel better about yourself when you discover how exercise helps you trim excess fat and gives your body a more toned and shapely appearance. Exercising regularly -- even at moderate levels -- can also help older people stay mentally sharp and may prevent the development of certain neurological disorders, including Alzheimer's disease. Exercise is not risk-free. Working out leaves you susceptible to muscle, joint and bone injury, especially if you choose an activity that's too advanced; increase your intensity too quickly; use equipment improperly; or fail to warm up or cool down appropriately. Some people feel shaky, light-headed, dizzy or nauseated when they exercise. Others experience heartburn or cramping. Compulsive exercise -- especially when combined with disordered eating -- can lead to a range of health problems, including insomnia, anxiety, menstrual irregularities and reduced bone density. In some cases, long-term excessive endurance exercise -- such as high-intensity distance running -- might be bad for the heart, according to a report presented by the Mayo Foundation for Medical Education and Research. The Mayo report notes, however, that the bigger mortality risk for most people is exercising too little, not too much. National Eating Disorders Association: Compulsive Exercise -- Too Much of a Good Thing? How Many Calories Do You Burn While Jogging 4.5 MPH? What Are Long-Term Exercise Effects?